In July 2008 I started the JFX Custom Nodes category that contains a growing series of posts in which a graphics designer (Mark Dingman of Malden Labs) and I are collaborating on an imaginary Sound Beans application. The objectives of building this application are to demonstrate how to create JavaFX custom nodes, and to provide a case study in how a graphics designer and an application developer can work together effectively in developing JavaFX applications. defined a DeckNode that stores a set of Node instances and displays one of these nodes at a time. defined a ProgressNode control that may be use to show the progress of an operation. That post also introduced a long overdue model class into the Sound Beans application. This is based upon the playlist comp (mock-up) that Mark Dingman gave me, shown in the Getting Decked: Another JavaFX Custom Node post. I subsequently asked him for a comp of a scrollbar that I could implement by drawing shapes (as opposed to using images). Mark's comp included the rounded rectangle for the proportional scrollbar thumb shown above, with the scrollbar's track having a slight horizontal gradient. In this iteration of our imaginary Sound Beans program, the number in the upper left hand corner of the UI will change as you click different rows in the table, demonstrating that you can bind to the selectedIndex attribute of the TableNode. In future iterations we'll cause the album graphics, title, etc. to change, and we'll dispense of that number in the upper left corner. Anyway, try it out by clicking on this Java Web Start link, keeping in mind that you'll need at least JRE 6. Also, installing Java SE 6 update 10 will give you faster deployment time. * Contains the height of the table in pixels. * Contains the height of each row in pixels. * the current row is filled. * The height (in pixels) of the space between rows of the table. * This space will be filled with the tableFill color. * The color or gradient of the vertical scrollbar. * The color or gradient of the vertical scrollbar thumb. * The width (in pixels) of the vertical scrollbar. Since the "way of JavaFX" is to bind UI attributes to a model, the content attribute of the TableNode is bound to the model as shown above. Shown below is the model for the Sound Beans program so far, in a file named TableNodeExampleModel.fx. Notice that the playlistObjects sequence can contain any kind of object, and that we're specifically avoiding putting Node instances in the model (as those belong in the UI). To populate the TableNode, therefore, I'm taking the approach of having the model contain strings such as album titles and the URL of an image. During the bind to the content attribute of the TableModel shown above, the Node subclasses (e.g. Text and ImageView) are created. * The total estimated number of seconds for the burn. * between 0 and 100 inclusive. As always, if you have any questions or input, please leave a comment. By the way, the images for this article can be downloaded so that you can build and run this example with the graphics. This is a zip file that you can expand in the project's classpath. You will need the ButtonNode, MenuNode, DeckNode and ProgressNode code from previous posts in this JFX Custom Nodes series. Well, you're in luck! There will be an Ask the Experts: JavaFX Preview, on August 18-22, 2008. You can post your questions during this session and get answers from key members of Sun's JavaFX engineering team. I am looking to model in the high fashion industry. I am planning on going on America's Next Top Model but I am wondering if it would be possible to go to college before I begin my career. I know that the career doesn't last forever and that is why I would like to go to college so that way I could get another job once I am too old to model. If you could tell me how long a modeling career lasts in the high fashion industry. Any additional information would be appreciated. Thank you. "Good example of a JavaFX table that doesn't use Swing. 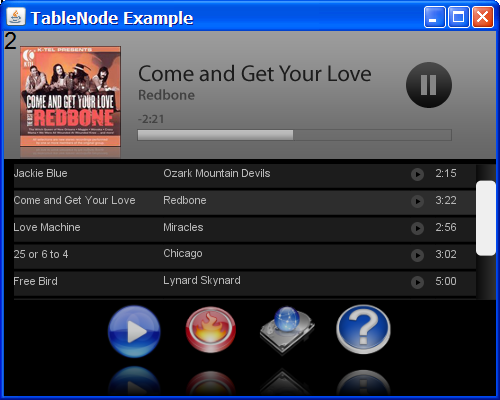 Do you have updated TableNode.fx code that will compile successfully with JavaFX 1.2?"